Last Sunday, April 8th, the sixth edition of the Gentry Open took place. It is the big Competitive event the League hosts to close off our six month seasons and it was, in a single word, amazing! 63 people made the trip to the outpost in Ghent and got an amazing goodie box that was only possible thanks to the generous sponsoring by Channel Fireball, Outpost Game Centers, Tournamentcenter.eu and Wizards of the coast. For those of you wondering, you can check here what you missed. More people might’ve come but the only available date being in the middle of Easter holidays may have cost us. That said, 63 players was close to a perfect fit for our judge staff and venue. A big Shout-out to Jeffrey, Bastiaan and head judge Floris for their great work here! Besides the event there was a lot going on as well, streaming, side events and marketing was supported by Anouk and myself. For those of you that want to rewatch the stream, you can go to our twitch or youtube channel, don’t forget to subscribe and/or follow if you don’t want to miss future updates. Everything is about the change when Dominaria gets added into the cardpool, and it looks like this set has what it takes to shake things up in a big big way. That doesn’t mean understanding what is played currently is not valuable anymore, so lets have a look at what was played in the Gentry Open. 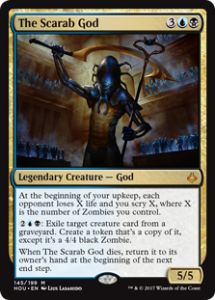 I am grouping these together because they are the “Scarab God Decks”. Each of them have a very distinct play style and card selection yet they all play The Scarab God as a late game trump that can round out games in swift fashion. An interesting thing to note is that the only God-Pharaoh’s Gift decks were base blue and black. Multiple people have tried to play these decks in many different color combinations yet only this version popped up at the Gentry Open. 3 people showed up with decks that had a theme so tightly woven in their UB decks that they did not manage to fit in The Scarab God, all three of these decks had very different builds, on focusing on Tezzeret’s Touch, another on Pirates and treasures and finally one that was build around abusing Incendiary Sabotage as much as possible. UR Control has fallen out of the format after being at the top in a prevvious iteration of Gentry. 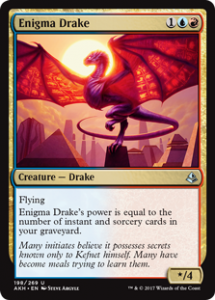 During that time the Drake sat on the bench as the deck waas the most dedicated control deck in the format and barely played creatures at all. That has changed, there are no creatureless versions of UR control going around and this time everybody chosxe to bring the Drake and his little undercosted friend. The Ixalan tribes showed up in numbers as well. Being easy to build and generally fun to play these are great options for novice deck builders and players. They allow for quite a lot of customisation and sideboarding. Pirates was notably missing. Nobody showed up with monored pirate aggro or UR raiding pirates. There was one UB deck focused on it, but that was more more as a side theme. Oketra’s Monument decks showed up in small numbers even though it won the Invitational recently. Thee deck heavily favors people that know all details of the deck and the metagame making it a scary deck for a lot of people to play. The mono white version of the deck both did better than the UW pilot. This deck has not changed a single card since the rotation last september and haas shown here that it is very definitely still a contender in Gentry. The deck is fun and challenging to play. There are a few deck building options available like playing Saheeli Raj and Panharmonicon for maximum infinite combo potential. That is most of the more known and established deck choices, there were tonnes of other decks to be spotted at the Gentry Open as well. 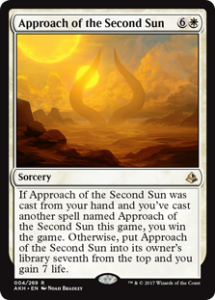 We saw 3 flavors of mono black, one going all out with discard and curses, one infinite combo with Bontu’s Monument and another choosing to couple hand disruption with the most aggressive creatures they could find. Want to play Control but not interested in playing blue? There where people sporting those aas well, with WB and RB based control decks popping up left and right. As long aas you are coupling Golden Demise with Dusk Legion Zealot and Ravenous Chupacabra it looks like you have plenty of options to play. Black green came peeking around as well and brought decks people have forgotten about, but that does not mean you can underestimate what an unchecked Winding Constrictor can do or how hard it is to control someone playing Nest of Scarab and a bunch of Supernatural Stamina. Want an aggro deck? You will be a rare beast in the room right now, but BR Vehicles was undefeated until round 5, RG Energy and burn based monored also caused some headaches for people who got matched with them. Favorable winds also had a champion. I have the feeling any of these decks could have been a big issue for all the decks preying on the esper decks by going a little slower and bigger. There were a few more decks that don’t really fit under one of the categories above, but none had a clear theme to sort them under and they did not get high enough in the tournament to catch attention. The top 8 decks are currently viewable in the decks tab. That will soon be reworked so I will post them below as well. Thank you again for everybody that was involved in any way in this event be it organising, judging, supporting, streaming, playing, watching or even thinking about it as you are completely isolated from it. The Gentry Open was a great event and keeps growing, lets see how big it gets next time around in september!